This is something I don't get. I thought I would post about it to see what anyone else thinks, and to try and find out what was done in the past (let's learn from the past). Anyway, on to the subject of this post….. When did you start giving your kids solid foods? How did you do it? What did you start with? Why? Your baby may be 3 months old or 4 months old when you start to feel she may need "something more" than formula or breastmilk. Maybe she is beginning to awaken more often at night or eat more often than "usual" and you wonder if introducing solid foods may what she needs. Ok….if the body is acting like it needs something more, doesn't it? Not according to the article. They say you need to wait until 6 months to give solids. But this is where I can't stretch my mind farther. The body isn't "ready" for life in the outside world when the baby is born either…the lungs haven't taken a breath, the stomach hasn't done anything, the eyes haven't seen anything….the list goes on. If you start solids, won't the body adjust? Of course it isn't ready….it hasn't had to adjust yet. Then, I read this article on Dr. Sears' website where I learn that in "the past" kids started food at 6 weeks. Well, they all didn't die….we have people around today. Anyway, I just don't get it. For some history, read this post on the Bellini Isabella Crib that Cyndi and I decided to buy. You’ll find out why we chose it over some others. 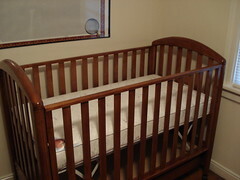 I assembled the crib this morning. There were soe differences between the instructions and what I saw. I wanted to post those on the internet just in case they may help someone else. First off, the pictures in the instructions aren’t very clear. They look like a copy of a copy of a copy (like someone at the factory lost the originals several times). In any of the pictures below, click the image for a larger version. You’ll also be able to download the full size image, if you need a closer look. 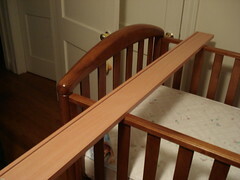 Before I started, I couldn’t tell which way was in or out on the head/footboards. The warning label goes on the inside. The inside has the 10 holes. The outside only has 4. Those 4 are near the bottom. The first picture wasn’t clear. 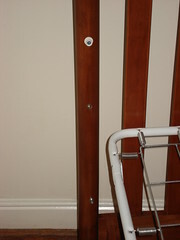 The proper orientation is with the roller to the “front”. The front is the side you want out. Here is a clearer picture I took. The front in this picture is to the right. You’ll notice I took this after mounting the mattress. The tabs go on the bottom. 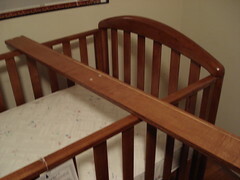 This picture is taken from the front left of the crib looking to the back right corner. By the way, the dust cover is the big single sheet. The picture didn’t say what was what. 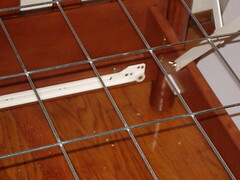 I originally assumed that the big piece would be used for the drawer…. To see the dust cover, click here. 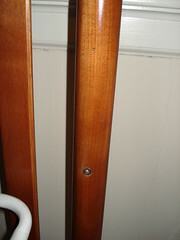 To see the two pieces for the drawer, click here. 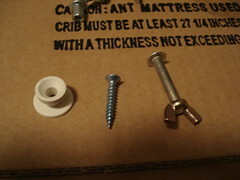 In step 4, it talks about using the H screws and G nuts. I didn’t have any bolts and nuts. What I figured out was I was supposed to use the bolts with the wing nuts. Actually, this may be a place to point this out…there were several fasteners that didn’t look as pictured. The picture to the right shows the ones that were different. On the left is the plastic disc X^2 (X squared). In the middle is the screw X (the picture in the front of the manual shows it more like a bolt). On the right is the screw H with nut G.
In step 6/diagram 5, it isn’t clear what goes where. There is a hole missing in the diagram. Bolt Y goes in the very bottom. Screw X and disk X^2 goes in the very top one (it is just a little pilot hole). The middle hole is empty. You’ll only use it in step 10/diagram 11 when you fix one of the sides. The picture to the right shows all three holes while the one to the left shows the top hole for screw X and disk X^2 and the middle hole to fix the fixed side later on. When you go to put the sides on, pay attention. The reference marks are simple indentations on the side. When I put the dropside on, I had it backwards and didn’t find this out until I tried it out. Instead of pushing the side in to get it down, I had to pull it out. 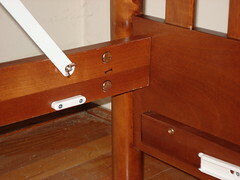 When assembling the drawer, the instructions didn’t mention which was the back and which was the front. It was easy to figure out…the dark one goes up front while the light one goes in the back. The top picture is of the back while the one on the bottom is on the front. Follow this link for more pictures I took. Over the past few weeks, I got sucked into a show on the Discovery Channel called Everest: Beyond the Limit. Tonight is the last episode. Before it aired, I wondered if I could find anything out on the internet. I started with the Wikipedia article on Everest. That led me to the Discovery Channel page on the show. Then, I came across this article by climbers on Everest. That caused me to look up POISK's website (they make oxygen equipment that looks like the best stuff on the market). I then thought I would look up the Himex site (they are the company that led the Discovery team up the mountain.) They want $42,000 to lead someone up Everest. In the end, read up on the controversy that Discovery filmed (but won't air). I used to think it would be neat to climb everest, but it looks like anyone with enough money can make an ascent now. Yes, you need to be in shape, but the sherpas do all the hard work. Historically, the most famous Sherpa is Tenzing Norgay, who climbed Mount Everest with Edmund Hillary for the first time in 1953. Two Sherpas, Pemba Dorjie and Lhakpa Gelu, have recently competed as to who can climb Everest quicker. On May 23, 2003 Dorjie summitted in 12 hours and 46 minutes. Three days later Gelu beat his record by two hours, summitting in 10 hours 46 minutes. On May 21, 2004 Dorjie again improved the record by more than two hours with a total time of 8 hours and 10 minutes. This feat may be considered one of the greatest in mountaineering. On May 19, 2006, Appa Sherpa successfully climbed Mt. Everest for the 16th time, breaking his own record for most successful ascents. Cyndi and I just returned from a trip to West Virginia where I had a Pepperoni Roll. These things are AWESOME! When I got back, I decided to look it up on Wikipedia to see if there was an article on it. If you have never heard of one, it looks like you are out of luck. The classic pepperoni roll consists of a fairly soft white yeast bread roll with pepperoni baked in the middle. The pepperoni can be either in the form of a stick or of several slices folded together. During baking, spicy oil from the pepperoni suffuses the bread. Most people prefer the rolls to be moist but not soggy; thus, the texture of the bread is an important factor in the rolls' quality. A typical pepperoni roll weighs about three ounces, and can be eaten as a snack or as the main dish of a lunch. Pepperoni rolls can be eaten cold, or can be warmed slightly in an oven or microwave. Although recipes for homemade pepperoni rolls are available, most West Virginians buy the rolls in shops. Most commercially available pepperoni rolls are made within the state by small, family-owned Italian-American bakeries. The rolls can be found in virtually every grocery and convenience store in West Virginia. Churches and schools in the state sometimes have pepperoni roll sales to raise funds. Outside West Virginia and its surrounding regions, pepperoni rolls are seldom, if ever, seen for sale. Some West Virginians believe they cannot be sold elsewhere in the United States because other states have regulations banning the sale of meat baked into bread. However, this appears to be an urban legend; many products matching this description, such as calzones, pasties, pot pies and samosas, are sold throughout the U.S. with no problems. It seems likely that the pepperoni roll is simply a regional speciality that has not been discovered by the outside world. Pepperoni rolls did face a legal challenge in 1987 when the United States Department of Agriculture proposed re-classifying bakeries that made the rolls as meat-packing plants, thus making them subject to stricter regulations. The bakery owners claimed that the costs of meeting the new regulations would put them out of business. The USDA's proposal was quashed after Jay Rockefeller, U.S. Senator for West Virginia, intervened. Pepperoni rolls caused a goof in the 1998 movie 'Whatever,'  which was set in New Jersey but filmed in West Virginia. In one scene set in a convenience store, a pile of pepperoni rolls on the counter gave away the store's true location. Well, I was searching on the web for stugg about GTMO (yes, it's really GTMO NOT GITMO…get it straight media!) when I came across a classic "You've been in list" that I thought I would share. You answer to "Hey, Mon" and your name is Steve. You start referring to the U.S. as overseas. Base Police can fill out your traffic tickets by heart. Someone says that GTMO stinks and you argue with him. You think Jamaican knit caps look sharp and buy one for yourself. The barge is two months late and you don’t care. Someone shows you a head of lettuce smuggled into GTMO by VC-10 and you ask where the rotten part is. You begin to think the Exchange carries the latest fashions. You buy your 86th Panama screen. Your Hummel collection is worth $8,000,000. Your Bosson Head collection is worth $12,000,000. Your Bosson Heads begin to talk to you. You talk back to your Bosson Heads. Your Bosson Heads talk to your Hummel firgurines. Your telephone hasn’t worked for 67 straight days and you don’t notice. PWD asks you for suggestions on how to improve telephone service and you don’t tell them to go to hell. You don’t cry after waiting 49 straight days at home for the plumber to show up and when he does, you are visiting the zoo. You begin to think VC-10 pilots are normal people. You realize that if Castro ever decided to come over the fence, you better know the Cuban National Anthem and how to cut sugar cane pretty d*** fast. You realize that Castro isn’t going to come over the fence in the first place because he couldn’t afford the commissary prices. Your pet iguana that you raised from a baby gets big enough to start eating dogs and small children. You stop expecting to see a banana rat in the banana rat cage in the zoo. Your correct name, number and address appears in the telephone book. You find a telephone number in the phone book. You can dial a telephone number 97 times straight, not get through and not curse. You realize that Marine Barracks is really just a year round summer camp for the Boy Scouts. You realize that FTG is really just a year round summer camp for the Sea Cadets. You realize that GTMO is really just a year round summer camp for the Marines. You read the items above and laugh at every one. What is the US coming to?? Here is a neat link to a video on Google Video showing a spray paint artist.